Blog | Spring Cleaning - Bring on the heat! Home / Blog / Spring Cleaning - Bring on the heat! Spring Cleaning - Bring on the heat! As the days get longer and the weather gets warmer, there tends to be an uplifting aura of spirit and some extra pep in each step. With this uplifting season comes a potentially negative drawback of the warmer weather and longer days – overheating electronics. Electronics have a life expectancy which is heavily affected by the ambient temperature and environment that the unit is being used in. As the temperature rises, the life expectancy of the electronic device drops at a pretty significant rate – a 10°C rise in temperature results in half the life expectancy of the component. 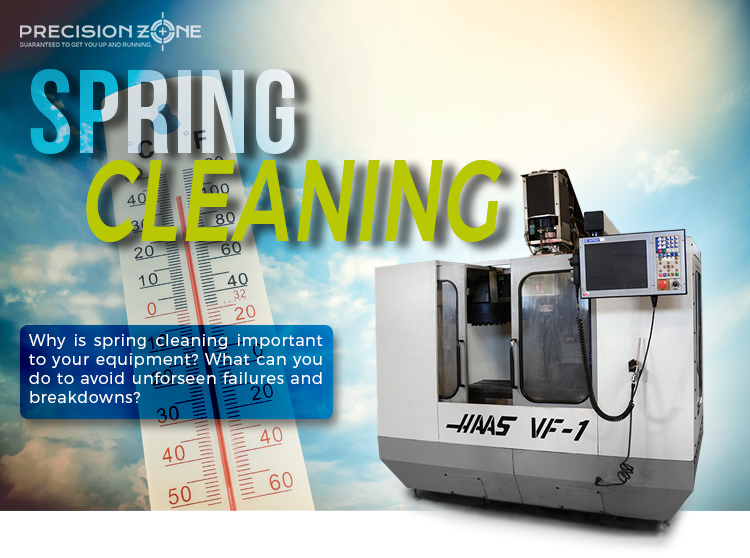 In an attempt to avoid unforeseen failures and downtime due to this, spring is one of the best times to set aside a little extra time to ensure all devices and units are being run in optimal conditions. Many heat-related issues will stem from cooling fans or other cooling devices not being able to properly disperse the heat, which creates a pocket of warmth surrounding the devices and can cause the electrical components to work less efficiently. With proper air distribution and ventilation, this pocket is drawn away from the unit generating the heat and allows it to work in a cooler ambient temperature, thus prolonging the time it can run until an issue will potentially arise due to excess heat. Along with the checking of these cooling devices, it is also recommended to go through and generate backups of each machine to ensure that if any issues do come up, it will be quick and easy to reload the parameters, programs, offsets, etc. if necessary. Most forms of CNC control have quick and easy methods of obtaining this backup which will usually be stated in the documentation for the machine. Some drive units will also use external braking devices or resistor banks which help dissipate extra current while decelerating or stopping the corresponding motor. This can also lead to creating a large amount of heat depending on the form of dissipation and can even be more intense if these modules used are not within their proper specs. For any questions in regards to checking cooling devices, backing up CNC machines, or inspecting external braking units, feel free to contact us by phone or email to get in touch with our experienced technical support team.